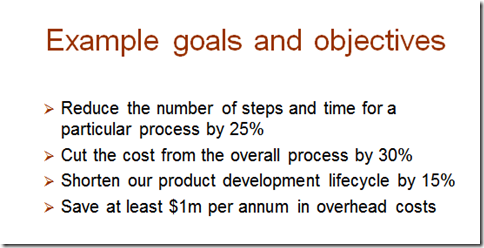 The first place to start is to determine process improvement and goals objectives. This might sound obvious but you would be amazed at how many miss this most fundamental step. Many managers want to focus on their pet project, rather than ensuring the organization as whole is going to benefit from the project. What are the most important issues for the project to achieve? For example…..
By systematically identifying these opportunities and how they might be classified in importance to the organization, we start to put some parameters around them. This will lead to very well defined goals and objectives for your project. Making it better is not usually enough of a goal to get management excited, particularly if you are going to need budget approval for the project. Every project costs money, even if you are using existing resources and staff, they are still be diverted to the new cause. Once you have them prioritized, then create a sample set of goals and objectives. 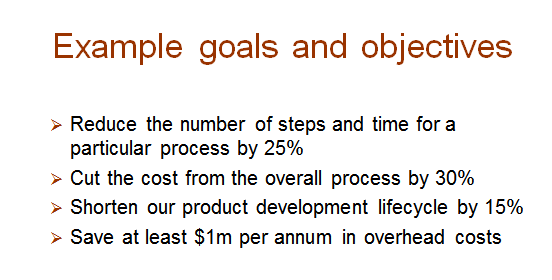 Remember these goals and objectives will be the foundation of the project. So ensure that you have everyone and management on board before moving forward.